Is the BigTouch the largest Windows 8 device yet? You want extra large (micro)chips with that? Big device maker InFocus has outed the St Bernard of PCs, a 70-inch All-in-One (AiO) that runs Windows 8. Dubbed BigTouch, the larger-than-life PC sports a huge 1080p display with 5-point touch that can display two apps side-by-side using Windows 8's snap function. You can also install fully-fledged desktop apps on it due to it running the full-fat version of Windows 8. Alternatively, you can sidestep Windows 8 completely and install Windows 7, if you wish. 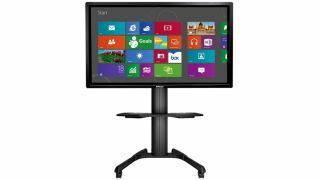 Because of its huge size, InFocus is pitching the PC as one suitable for anything from digital signage to whiteboard sharing. It comes with free 60-day trial of the company's BigNote app, which lets you take notes, sketch and annotate files using your finger or a stylus. Inside is an Intel Core i5 processor, 120GB SSD drive and 4GB of DDR3 main memory. It also offers an eye-popping array of connectivity ports that include seven USB ports, LAN, 802.11 a/b/g/n Wi-Fi, two HDMI ports, a 3.5mm sound input jack and VGA. It joins an already existing 55-inch model BigTouch that offers the same features but doesn't hog quite as much space. InFocus has also outed a second 70-inch AiO PC dubbed Mondopad. The device, which isn't a tablet as the name suggests (Arnie in his heyday would have struggled picking it up), is an AiO that's geared toward networking thanks to the inclusion of built-in video conferencing and the ability to share files while holding calls. It also features adjustable speakers that can be mounted to the side or bottom of the device and comes with the full suite of Microsoft office. We've contacted InFocus to get an idea of how much the devices, which are available now, will set you back. Alternatively, you can plump for a quote on its website. We ask: is the PC dead, or has it just gone high end?